You may arrange with him to fill his sack with gifts, and then add a personal touch when he calls out the name on each package. Of course; Santa’s always ready for pictures either, with your professional photographer or candid photos by parents and friends. He’s very good at creating those special poses for snapshots that will make Grandma ooh and aaah! 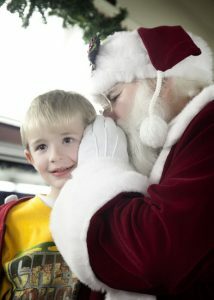 Santa’s also a good story teller. He’ll hold the attention of all with his telling of “The Night Before Christmas” or take you on a magical train ride to the “North Pole” on “The Polar Express”. You may even wish Santa to lead your guests in a song or two of the season. He will bring smiles to the faces of all who see him. He may have a surprise or two in his sack, a bit of Santa Magic that’s sure to bring on the laughter. Everyone will enjoy the experience as Santa brings the spirit of the holidays to you and creates a memorable event for your guests.